Porsche has taken 911 special variant editions to all new levels, with this — the Porsche 911 GT3 RS VM edition. It's the first ever Porsche designed to withstand the insane pressures found on both the race track and in highway construction zones. Yes, the VM (which stands for Verkehrsministerium, the German word for Department of Transportation) Edition lets you have your track day cake and eat it too — knowing you can drive your car to work the next morning. Hey, Porsche has always marketed their products as sports cars that can be used both in competition and for everyday duties, right? 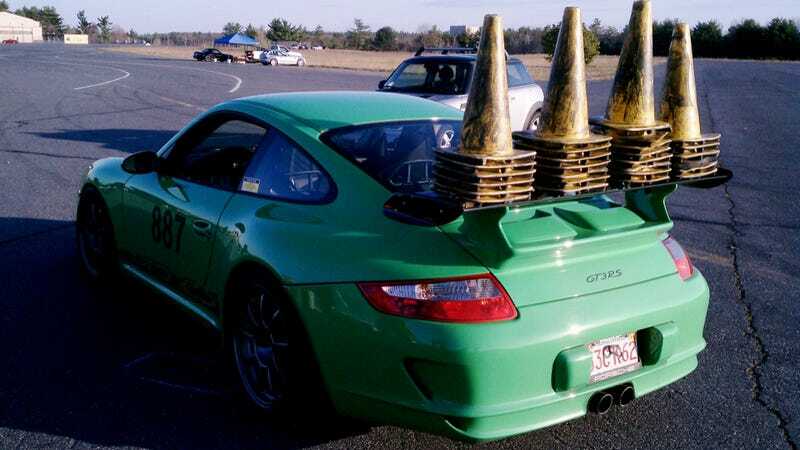 Well then why wouldn't we think this Porsche 911 GT3 RS being used as a autocross-course duty car was just another 911 variant, hmm? No word yet on how much extra downforce this arrangement produces, or whether this was before or after corner weighting.